Methods of making miscible and compatible immiscible polymer blends are disclosed. The polymer blends have a polyimide as a component. The miscible polymer blends have a single glass transition temperature. The compatible polymer blends have two glass transition temperatures. Compositions having a polymer blend and methods of making them are disclosed herein. The invention includes methods of making thermoplastic compositions comprising a non-delaminated polymer blend. In one embodiment a method of making a polymer blend comprises melt mixing a pre-polymer and a polymer. The pre-polymer has a component selected from the group consisting of free amine groups, free anhydride groups, and combinations thereof; and comprises structural units derived from a dianhydride and a diamine. The polymer comprises a reactive member selected from the group consisting of structural groups, end groups, and combinations thereof. The reactive member is reactive with the free anhydride groups, the free amine groups, or combinations thereof. The polymer blend is non-delaminated. In some embodiments the method comprises using a polymer comprising structural units derived from a dianhydride and a diamine. In some embodiments the pre-polymer and polymer employ a common diamine or dianhydride. When the pre-polymer and polymer employ a common diamine or dianydride the polymer blend may have a predetermined glass transition temperature, provided that the pre-polymer and polymer are present in amounts sufficient to provide a blend having the selected glass transition temperature. In some embodiments the method comprises using a pre-polymer and a polymer derived from different diamines and dianhydrides. When the pre-polymer and polymer are derived from different diamines and dianhydrides the polymer blend may have more than one predetermined glass transition temperature. In some embodiments a method of making a composition comprises forming a polymer blend by melt mixing a pre-polymer and a polymer and then melt mixing the polymer blend with an additional component. The pre-polymer comprises a component selected from the group consisting of free amine groups, free anhydride groups, and combinations thereof and comprising structural units derived from a dianhydride and a diamine. The polymer comprises a reactive member selected from the group consisting of structural groups, end groups, and combinations thereof. The reactive member is reactive with the free anhydride groups, the free amine groups, or combinations thereof. The terms “first,” “second,” and the like, “primary,” “secondary,” and the like, “(a),” “(b)” and the like, as used herein do not denote any order, quantity, or importance, but rather are used to distinguish one element from another. The terms “a” and “an” do not denote a limitation of quantity, but rather denote the presence of at least one of the referenced item. “Optional” or “optionally” means that the subsequently described event or circumstance may or may not occur, and that the description includes instances where the event occurs and instances where it does not. The endpoints of all ranges directed to the same component or property are inclusive of the endpoint and independently combinable. Reference throughout the specification to “one embodiment,” “another embodiment,” “an embodiment,” “some embodiments,” and so forth, means that a particular element (e.g., feature, structure, property, and/or characteristic) described in connection with the embodiment is included in at least one embodiment described herein, and may or may not be present in other embodiments. In addition, it is to be understood that the described element(s) may be combined in any suitable manner in the various embodiments. As used herein “substantially free of benzylic protons” or “essentially free of benzylic protons” means that the pre-polymer, such as for example a polyimide sulfone pre-polymer, has less than about 5 mole % of structural units, in some embodiments less than about 3 mole % structural units, and in other embodiments less than about 1 mole % structural units derived containing benzylic protons. “Free of benzylic protons,” which are also known as benzylic hydrogens, means that the pre-polymer contains zero mole % of structural units derived from monomers and end cappers containing benzylic protons or benzylic hydrogens. The amount of benzylic protons can be determined by ordinary chemical analysis based on the chemical structure. In one embodiment the polymer blend is essentially free of benzylic protons. The term “polymer blend” as used herein means a macroscopically homogeneous mixture of two or more different polymers. The term “miscible blend” describes a polymer blend having a single glass transition temperature (Tg) and a monophasic resin morphology as determined by transmission electron microscopy at a magnification of fifteen thousand (15,000). “Delamination” describes the separation of a surface layer from the body of an article molded from a polymer composition. The presence or absence of delamiration can be determined by visual inspection (20/20 vision) at a distance of one half (½) meter as described in greater detail below. 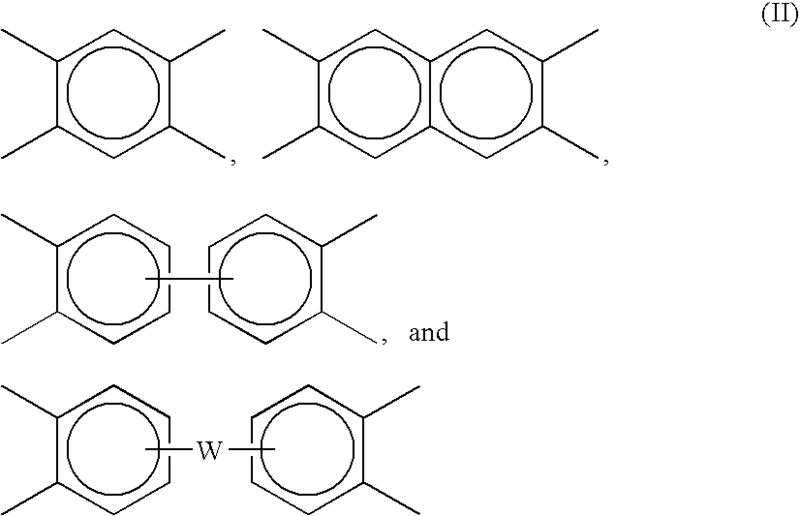 wherein W is a divalent moiety such as —O—, —S—, —C(O)—, —SO2—, —SO—, —CyH2y (y being an integer of 1 to 20), and halogenated derivatives thereof, including perfluoroalkylene groups, or a group of the formula —O—Z—O— wherein the divalent bonds of the —O— or the —O—Z—O— group are in the 3,3′, 3,4′, 4,3′, or the 4,4′ positions, and wherein Z includes, but is not limited to, divalent moieties of formula (III). wherein Q is defined as above. Examples of specific organic diamines are disclosed, for example, in U.S. Pat. Nos. 3,972,902 and 4,455,410. Exemplary diamines include ethylenediamine, propylenediamine, trimethylenediamine, diethylenetriamine, triethylenetertramine, hexamethylenediamine, heptamethylenediamine, octamethylenediamine, nonamethylenediamine, decamethylenediamine, 1,12-dodecanediamine, 1,18-octadecanediamine, 3-methylheptamethylenediamine, 4,4-dimethylheptamethylenediamine, 4-methylnonamethylenediamine, 5-methylnonamethylenediamine, 2,5-dimethylhexamethylenediamine, 2,5-dimethylheptamethylenediamine, 2,2-dimethylpropylenediamine, N-methyl-bis(3-aminopropyl)amine, 3-methoxyhexamethylenediamine, 1,2-bis(3-aminopropoxy)ethane, bis(3-aminopropyl)sulfide, 1,4-cyclohexanediamine, bis-(4-aminocyclohexyl)methane, m-phenylenediamine, p-phenylenediamine, 2,4-diaminotoluene, 2,6-diaminotoluene, m-xylylenediamine, p-xylylenediamine, 2-methyl-4,6-diethyl-1,3-phenylene-diamine, 5-methyl-4,6-diethyl-1,3-phenylene-diamine, benzidine, 3,3′-dimethylbenzidine, 3,3′-dimethoxybenzidine, 1,5-diaminonaphthalene, bis(4-aminophenyl)methane, bis(2-chloro-4-amino-3,5-diethylphenyl)methane, bis(4-aminophenyl)propane, 2,4-bis(p-amino-t-butyl)toluene, bis(p-amino-t-butylphenyl)ether, bis(p-methyl-o-aminophenyl)benzene, bis(p-methyl-o-aminopentyl)benzene, 1,3-diamino-4-isopropylbenzene, bis(4-aminophenyl)sulfide, bis(4-aminophenyl)sulfone, bis(4-aminophenyl)ether and 1,3-bis(3-aminopropyl)tetramethyldisiloxane. Mixtures of these compounds may also be used. In one embodiment the diamine is an aromatic diamine, or, more specifically, m-phenylenediamine, p-phenylenediamine, sulfonyl dianiline and mixtures thereof. In one embodiment the diamine is selected from the group consisting of diamino diaryl sulfones, metaphenylene diamines, paraphenylene diamines, and combinations thereof. Polyetherimide polymers and pre-polymers may have varying levels of amine and anhydride end groups depending on the amounts of diamine and dianhydride used in the polymerization reaction and the degree of completeness of the polymerization reaction. A variety of amine, anhydride, and anhydride derivatives such as carboxylic acids, carboxylate salts, amide-acids and amide-carboxylate salts are examples of possible end groups. As used herein it will be understood that the term “amine end groups” comprises end groups that are amines, and any related end groups that are derived from amine end groups. As used herein it will also be understood that the term “anhydride end groups” comprises end groups which are anhydrides and anhydride derivatives such as carboxylic acid, carboxylate salts, amide-acids and amide-carboxylate salts. All types, more than one type or essentially one type of these end groups may be present. In general, total reactive end group concentrations of a polyetherimide can be 0.05 to 0.3 mole % resin. In contrast, the total reactive end group concentrations of a pre-polymer can be 0.5 to 20 mole %. As used herein, the term “reactive end group” refers to any of the various possible end groups that can give rise to volatile species during melt processing. Most reactive end groups will be amine or anhydride. In one embodiment, the pre-polymer has a total reactive end group content of 1 to 10 mole %, or, more specifically, 5 to 10 mole %. The polymer comprises end groups reactive with anhydride, amine or a combination thereof under melt mixing conditions. Exemplary endgroups include and are not limited to amine, anhydride, hydroxyl, alcohol, amide, epoxide, ester, thiol, acid and activated aromatic halide, and combinations thereof. Exemplary polymers include polyimides, polyetherimides, polyamideimides, polyaryl ether ketones, polyaryl ketones, polyether ketones, polyether ether ketones, polyaryl sulfones, liquid crystal polymers, polyamides, polyesters, polysulfones, polyphenylene sulfides, polybenzimidazoles, polyphenylenes, and combinations thereof. The foregoing exemplary polymers are commercially available e.g., Aurum polyimides (Mitsui), ULTEM polyetherimides (GE), PEEK (Victrex), Radel polysulfones (Solvay) and Fortron PPS (Ticona). The compositions described herein may further contain fillers, reinforcements, additives, and combinations thereof. Exemplary fillers and reinforcements include fiber glass, milled glass, glass beads, flake and the like. Minerals such as talc, wollastonite, mica, kaolin or montinorillonite clay, silica, quartz, barite, and combinations of two or more of the foregoing may be added. The compositions can comprise inorganic fillers, such as, for example, carbon fibers and nanotubes, metal fibers, metal powders, conductive carbon, and other additives including nano-scale reinforcements as well as combinations of inorganic fillers. In another embodiment, the compositions may further include second polymer. Examples of such polymers include and are not limited to PPSU (polyphenylene sulfone), PEI (poly(ether imide)), PSU (polysulfone), PC (polycarbonate), PPE (polyphenylene ether), PMMA (poly methyl methacrylate), ABS (acrylonitrile butadiene styrene), PS (polystyrene), PVC (polyvinylchloride), PFA (per fluoro aalkoxy alkane), MFA (co-polymer of TFE tetra fluoro ethylene and PFVE perfluorinated vinyl ether), FEP (Fluorinated ethylene propylene polymers), PPS (poly(phenylene sulfide), PEK (poly(ether ketone), PEEK (poly(ether-ether ketone), ECTFE (ethylene chloro trifluoro ethylene), PVDF (polyvinylidene fluoride), PTFE (polytetrafluoroethylene), PET (polyethylene terephthalate), POM (polyacetal), PA (polyamide), UHMW-PE (ultra high molecular weight polyethylene), PP (polypropylene), PE (polyethylene), HDPE (high density polyethylene), LDPE (low density polyethylene), PBI (polybenzimidizole), PAI (poly(amide-imide), poly(ether sulfone), poly(aryl sulfone), polyphenylenes, polybenzoxazoles, polybenzthiazoles, as well as blends and co-polymers thereof. The compositions of the invention can be formed into articles by any number of methods. Preferred methods include, for example, injection molding, blow molding, compression molding, profile extrusion, sheet or film extrusion, sintering, gas assist molding, structural foam molding and thermoforming. Film and sheet extrusion processes may include and are not limited to melt casting, blown film extrusion and calendering. Examples of such articles include, but are not limited to, films, membranes, tubing, composites, semi-conductor process tools, wire coatings and jacketing, fluid handling components, cookware, food service items, medical devices, trays, plates, handles, helmets, animal cages, electrical connectors, enclosures for electrical equipment, engine parts, automotive engine parts, bearings, lighting sockets and reflectors, electric motor parts, power distribution equipment, communication equipment, computers and the like, including devices that have molded in snap fit connectors. The blends can also be used as fibers. In addition the blends can be used as coatings, for example powder coatings. The physical properties of the compositions, and articles derived from the compositions, are useful and can vary. For instance, in embodiments where the pre-polymer and the polymer comprise a common diamine, the polymer blend can have a single resin glass trainsition temperature. In another embodiment, the composition (and articles made from the composition) can have heat deflection temperature (HDT) of greater than or equal to 100° C., according to ASTM D648. In one embodiment, compositions can have an HDT ranging of 100° C. to 400° C., according to ASTM D648. In another embodiment, the compositions, and articles derived from the compositions, can have a tensile strength of greater than or equal to 70 megaPascals (MPa) according to ASTM D638. In one embodiment, the compositions and articles can have a tensile strength of 70 MPa to 500 MPa. The coefficient of thermal expansion of the compositions can vary. In one embodiment, the coefficient of thermal expansion is less than 100 ppm/° C. from 30° C.-200° C. as measured by thermal mechanical analysis with a thermal ramp rate of 5° C./minute. In another embodiment, the coefficient of thermal expansion is 5 to 100 ppm/° C. from 30° C.-200° C. as measured by thermal mechanical analysis with a thermal ramp rate of 5° C./minute. Advantageously, the compositions described herein now provide previously unavailable compositions and articles. For instance, the compositions can overcome the problem of delamination in an immiscible, incompatible blends and exhibit immiscible, but compatible blend features having highly useful applications. The compositions can provide a much wider range of miscible blend compositions. Compositions of the invention can exhibit an improved visual transparent appearance. Extending the range of miscibility in such blends has significant practical importance. It is now possible to make a wide variety of blend compositions with a single glass transition temperature (Tg) and predetermined transparency. The compositions were tested for glass transition temperature using differential scanning calorimetry (DSC). Morphology was determined by visual inspection using ASTM tensile bars. The tensile bars were aged at 280° C. for 240 hours and checked for delamination by visual inspection. Visual inspection was determined by normal vision (e.g., 20/20 vision in the absence of any magnifying device with the exception of corrective lenses necessary for normal eyesight) at a distance of one half (½) meter. Results are shown in Tables 2 and 3. Thus, Examples 5-7 showed that blending with a reactive pre-polymer improved the miscibility in an immiscible, but compatible blend and resulted in a much wider range of miscible blend compositions. The visual appearance also improved from transluscent to transparent. Extending the range of miscibility in such a blend has significant practical importance since a wide variety of blend compositions with a single Tg and transparency could now be designed. wherein the polymer blend is non-delaminated. 2. The method of claim 1, wherein the polymer is selected from the group consisting of polyimides, polyetherimides, polyamideimides, polyaryl ether ketones, polyaryl ketones, polyether ketones, polyether ether ketones, polyaryl sulfones, liquid crystal polymers, polyamides, polyesters, polysulfones, polyphenylene sulfides, polybenzimidazoles, polyphenylene ethers, and combinations of two or more of the foregoing. 3. The method of claim 1, wherein the pre-polymer is present in an amount of 1 weight percent to 99 weight percent, based on the combined weight of the pre-polymer and the polymer and the polymer is present in an amount of 1 weight percent to 99 weight percent, based on the combined weight of the pre-polymer and the polymer. 4. The method of claim 3, wherein the pre-polymer is present in an amount of 10 weight percent to 90 weight percent, based on the combined weight of the pre-polymer and the polymer and the polymer is present in an amount of 10 weight percent to 90 weight percent, based on the combined weight of the pre-polymer and the polymer. 5. The method of claim 4, wherein the pre-polymer is present in an amount of 20 weight percent to 80 weight percent, based on the combined weight of the pre-polymer and the polymer and the polymer is present in an amount of 20 weight percent to 80 weight percent, based on the combined weight of the pre-polymer and the polymer. 6. The method of claim 1, wherein the pre-polymer has a ratio of carbon atoms/(nitrogen atoms+oxygen atoms+sulfur atoms) of 2.8 to 4.2. 8. The method of claim 7, wherein the first dianhydride and the second anhydride are the same and are selected from the group consisting of oxydiphthalic anhydrides, bisphenol-A dianhydrides, and combinations thereof. 9. The method of claim 7, wherein the first diamine and the second diamine are the same and are selected from the group consisting of diamino diaryl sulfones, metaphenylene diamines, paraphenylene diamines, and combinations thereof. 10. The method of claim 7, wherein the pre-polymer is present in an amount of 1 weight percent to 99 weight percent, based on the combined weight of the pre-polymer and the polymer and the polymer is present in an amount of 1 weight percent to 99 weight percent, based on the combined weight of the pre-polymer and the polymer. 11. The method of claim 7, wherein the pre-polymer is present in an amount of 10 weight percent to 90 weight percent, based on the combined weight of the pre-polymer and the polymer and the polymer is present in an amount of 10 weight percent to 90 weight percent, based on the combined weight of the pre-polymer and the polymer. 12. The method of claim 7, wherein the pre-polymer is present in an amount of 20 weight percent to 80 weight percent, based on the combined weight of the pre-polymer and the polymer and the polymer is present in an amount of 20 weight percent to 80 weight percent, based on the combined weight of the pre-polymer and the polymer. 13. The method of claim 7, wherein the pre-polymer comprises structural units derived from oxydiphthalic anhydrides and diamino diaryl sulfones and the polymer comprises structural units derived from bisphenol-A dianhydrides and diamino diaryl sulfones. 14. The composition of claim 7, wherein the pre-polymer has a ratio of carbon atoms/(nitrogen atoms+oxygen atoms+sulfur atoms) of 2.8 to 4.2.
wherein the pre-polymer is an incompletely imidized oligomer. 16. The method of claim 15, wherein the first dianhydride or the second anhydride is selected from the group consisting of oxydiphthalic anhydrides, bisphenol-A dianhydrides, and combinations thereof. 17. The method of claim 15, wherein the first diamine or the second diamine is selected from the group consisting of diamino diaryl sulfones, metaphenylene diamines, paraphenylene diamines, and combinations thereof. 18. The method of claim 15, wherein the pre-polymer is present in an amount of 1 weight percent to 99 weight percent, based on the combined weight of the pre-polymer and the polymer and the polymer is present in an amount of 1 weight percent to 99 weight percent, based on the combined weight of the pre-polymer and the polymer. 19. The method of claim 15, wherein the pre-polymer is present in an amount of 10 weight percent to 90 weight percent, based on the combined weight of the pre-polymer and the polymer and the polymer is present in an amount of 10 weight percent to 90 weight percent, based on the combined weight of the pre-polymer and the polymer. 20. The method of claim 15, wherein the pre-polymer is present in an amount of 20 weight percent to 80 weight percent, based on the combined weight of the pre-polymer and the polymer and the polymer is present in an amount of 20 weight percent to 80 weight percent, based on the combined weight of the pre-polymer and the polymer. 21. The method of claim 15, wherein the pre-polymer has a ratio of carbon atoms/(nitrogen atoms+oxygen atoms+sulfur atoms) of 2.8 to 4.2.
wherein the first dianhydride is the same as the second dianhydride or the first diamine is the same as the second diamine. 23. The method of claim 22, wherein the pre-polymer has a ratio of carbon atoms/(nitrogen atoms+oxygen atoms+sulfur atoms) of 2.8 to 4.2.
wherein the first dianhydride is different from the second dianhydride and the first diamine is different from the second diamine. 25. The method of claim 24, wherein the pre-polymer has a ratio of carbon atoms/(nitrogen atoms+oxygen atoms+sulfur atoms) of 2.8 to 4.2. NL8703118A (en) * 1987-12-23 1989-07-17 Stamicarbon Process for the preparation of a polymer composition on the basis of a prepolymer and a thermoplastic polymer. ASTM D638, Standard Test Method for Tensile Properties of Plastics, 15 pages. ASTM D648, Standard Test Method for Deflection Temperature of Plastics Under Flexural Load in the Edgewise Position, 12 pages. Chan, et al, Facile Quantative Analysis of Hydroxyl End Groups of Poly(2,6-dimethyl-1,4-phenylene oxide)s by P NMR Spectroscopy, Macromolecules, 1994, 27, 6371-6375. 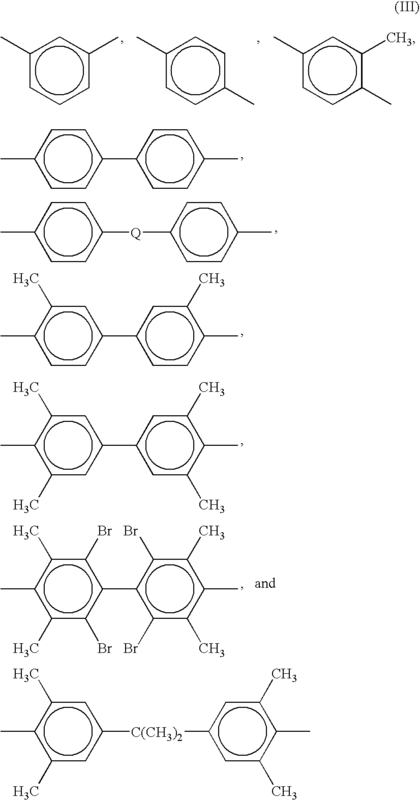 Chao, A P NMR study of poly(phenylene oxide) (PPO)(1) resin's hydroxyl end groups, Polymer Bulletin 17, 1987, 397-401.
International Search Report for International Application No. PCT/US2007/075809, mailed Jan. 7, 2008, 5 pages. International Search Report for International Application No. PCT/US2007/075812, mailed May 7, 2008, 5 pages. International Search Report for International Application No. PCT/US2007/075993; Mailed Nov. 13, 2007; 5 pages. JP08239645 Abstract; Sep. 17, 1996; 1 page. JP408143667A With Abstract; Published Jun. 4, 1996; 10 pages. JP58007449 Abstract; Jan. 17, 1983; 1 page. Kim, et al., Kinetic and Mechanistic Investigations of the Formation of Polyimides under Homogenous Conditions, Macromolecules, 1993, vol. 26, 1344-1358. Kreuz, et al, Studies of Thermal Cyclizations of Polyamic Acids and Tertiary Amine salts, Journal of Polymer Science, Part A-1, 1966, vol. 4, 2607-2616. Written Opinion for International Application No. PCT/US2007/075809, mailed Jan. 7, 2008, 6 pages. Written Opinion for International Application No. PCT/US2007/075812, mailed May 7, 2008, 5 pages. Written Opinion for International Application No. PCT/US2007/075993; Mailed Nov. 13, 2007; 6 pages.